The No. 6 ranked Clarkston Angoras and the Tucker Tigers were the lone bright spots on a night when four DeKalb soccer teams’ seasons would end. The toughest loss would come as the No. 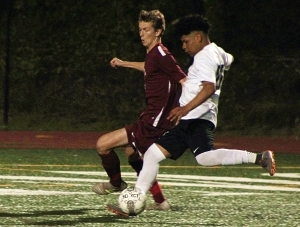 1 ranked Cross Keys Indians (15-2-0) would score an own goal that made the difference in a 2-1 loss to Grady at Adams Stadium on Wednesday night. The two teams played a scoreless first half, but with 34:51 left in the game Eduardo Dimas got behind the Grady defense on a nice pass from Jose Romero to give Cross Keys what would be a short-lived lead. Grady would tie the game just 39 seconds later as a free kick lifted into the air in front of the Cross Keys goal was headed into the goal by an Indians’ defender to make it 1-1 and Grady took all the momentum from that point as they kept attacking Cross Keys’ defense. Five minutes following the own goal the Knights had a throw in from the right side of the goal and Grady got the ball into the goal for the 2-1 advantage. Grady’s tender made three nice saves as the clock started to go against Cross Keys. The Indians had one great opportunity ended on a late offsides call and then with 7:20 to play Josue Flores open shot at the goal went just over the cross bar. The Knights would continue to run the clock down to seal the upset. The Clarkston Angoras (17-3-1) put up a goal in the first half and added two insurance goals in the second half to move into the second round with a 3-0 win over North Springs. No. 3 ranked Carrollton (16-3-0), a 3-0 winner over Flowery Branch, is next for the Angoras. The game will be at Carrollton with the date and time to be determined. Tucker traveled to Conyers to take on Heritage in Class 6A boys’ play and came out as a 2-0 victor to advance to the second round. The Tigers (10-7-2) scored two goals in the first half and made it stand to secure a spot in the Sweet 16. Tucker scored quickly in the fifth minute of play and made it 2- at the half with a goal in the 32nd minute. The Tigers now must travel to South Georgia to take on Valdosta (15-2-1) which defeated Brunswick 3-0. Arabia Mountain fell 6-0 on the road to No. 2 ranked Decatur to finish 11-7-0 on the season. Grady knocked off the Cross Keys Lady Indians (8-5-0) 6-0 in girls’ Class 5A play as well while Redan (8-6-1) fell 10-0 to Bremen (13-0-4) in a Class 3A road contest.